vbac or bust: New Year, New Trimester! 2nd pregnancy on the left, 1st pregnancy on the right. Happy 2012! Thought I would give everyone a quick update. 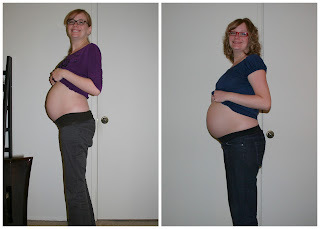 As we barrel into the new year, I'm barreling into the 3rd (and final) trimester. I am feeling great! Keeping active with walking, being the mother to a 1 1/2 year old, and occasionally, a yoga DVD. Honestly, I haven't been doing yoga as much as I'd like, the holidays are exhausting!!! Getting heartburn back, and some fatigue. Thanks to my awesome chiropractor, my back/hips are feeling amazing. I have gained some weight, nearly 20lbs now. And it kind of pisses me off! I mean, everyone can always eat healthier. But I am eating REALLY healthy, and still gained 8lbs last month. This is why I don't weigh myself. (perhaps I should start) I was able to tell my midwife, that whatever weight I gained, I must have needed, because I have been eating amazing! I mean, I've only had french fries twice in the past 6 months. Perhaps a little more chocolate than I should, but I think I NEED some chocolate. Lets just hope everything comes back normal from my gestational diabetes test. We have hired a doula! And I have been to one birthing class, and will resume classes in 2 weeks. I have also been attending local ICAN meetings. I am not sure where I would be without their constant support. A friend has also offered to throw me a Blessingway. I can't wait! (here is a link if you want to read up!) http://www.naturalbirthandbabycare.com/blessingway.html I have also registered for about 4 things on Amazon. We don't really need anything, but it would be nice to get a new stroller. I have days where I feel a little scared/emotional about birth, and then I have days I feel that I could birth a 20lb 3 month old, with no complications. I am hoping that the birthing classes will get me in the best mental state possible, and that I can stay there. I plan on re-reading The Silent Knife, Birthing From Within, and Ina May's new book, A Midwives Manifesta, sometime here in the near future. If you have any other tips, for getting in a peaceful state of mind, leave them here!